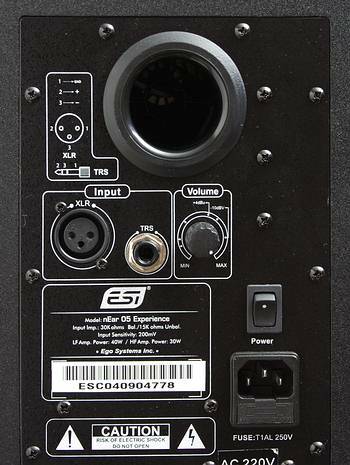 ESI, better known to our readers as a manufacturer of professional sound cards, also offers a series of active studio near-field monitors. There are five models, including one active sub-woofer. We should clarify that the title of each model characterizes the cone size in its medium frequency speaker. Thus, nEar 04, nEar 05 classic, nEar 06 and SW-10K monitors use speakers with 4", 5", 6" and 10" cones correspondingly. Not long ago, a new model appeared in the series of reference monitors - nEar 05 eXperience. Judging from the title of the new model, the manufacturer did not intend to produce something absolutely new, just a higher-quality product, free of drawbacks in nEar 05 classic. We don't rule out a possibility that it was done for marketing reasons, as the new model resembles nEar 05 classic monitors in its exterior. According to the manufacturer, the new nEar 05 eXperience model boasts of the top audio quality, ultra-flat low frequency response, unparalleled punch in the low-mid frequency. It's positioned as an excellent monitoring speaker especially suited for vocal recording. But unfortunately, we cannot compare the audio quality of the new model with nEar 05 classic, as we have no idea about the 05 classic quality. So, let's examine nEar 05 eXperience monitors in detail. The nEar 05 eXperience monitors have a different, slightly old-fashioned design. In our opinion, the exterior of nEar 04 and nEar 05 monitors is much more interesting. On the other hand, different design in different models is a good thing. Lest it should have a negative effect on the audio quality. These monitors use different drivers as well. MF driver cone of the new model is made of kevlar. Its diameter is 11.5 cm. Damped rubber surround is a tad too tough to the touch. 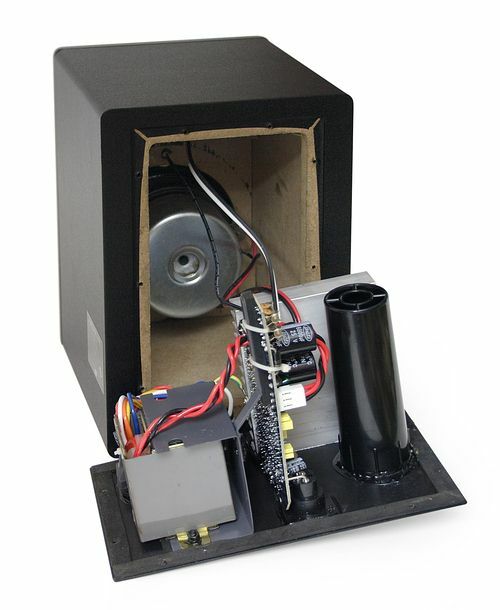 The manufacturer uses a soft dome tweeter for a HF driver. Dome diameter is 22 mm. Monitor dimensions are relatively small - 17x25x20 cm. 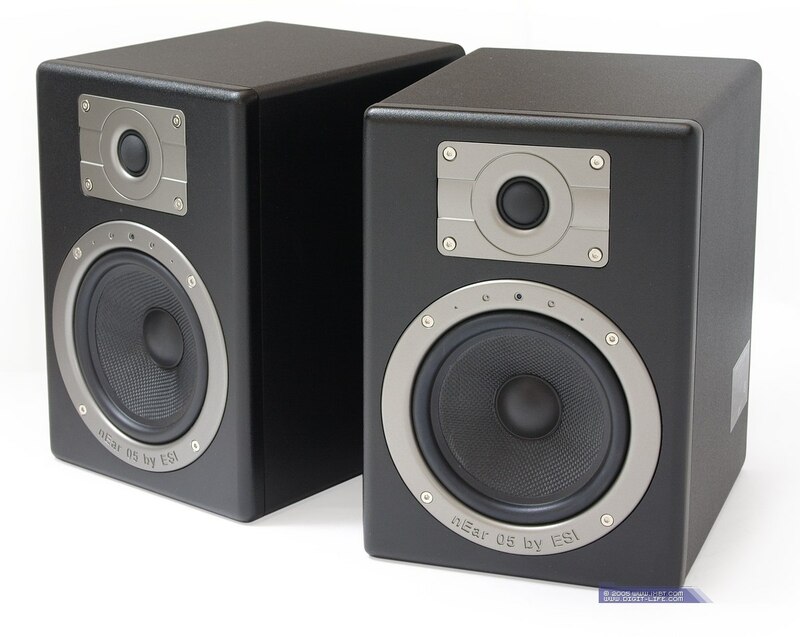 These monitors are based on the acoustic scheme with a sub-frequency port. Sub-frequency port is located at the rear panel. You should take it into account, if you intend to put them on your desk. The rear panel houses a power switch, a volume control, and two XLR and TRS Line-Ins. Both balanced and unbalanced connections are possible. There is no acoustic absorber inside a cabinet, the amplifier is placed in the same chamber with drivers. Nevertheless, every component is mounted firmly. For example, the board with elements is fixed at three sides and shielded from the transformer. There is also a heatsink inside the cabinet. The manufacturer uses two TDA2052 monochips from STMicroelectronics as amplifiers. We have come across such chips in reference monitors for the first time. Let's have a look at the distortions vs. power graph, taken from the chip specifications. The chip offers good power capacity at the low distortion level. TDA2052 delivers up to 25 Watts at ±18V and 0.1% THD. It's quite enough for small dimensions of these monitors. Frequency response and distortion measurements in RMAA 5.4 were carried out with a professional sound card ESI Juli@ (frequency response in loopback at 20 Hz - 20 Hz is -0.06, +0.05 dB) and a measurement microphone Behringer ECM 8000. 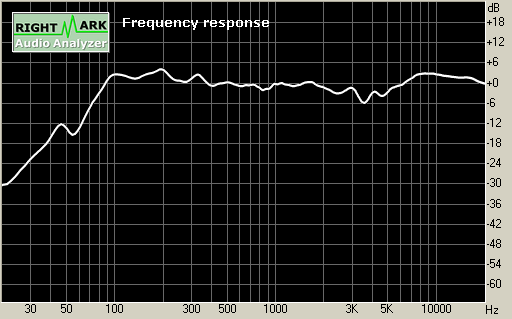 Let's have a look at the frequency response graph for a swept sine played back by the monitors. 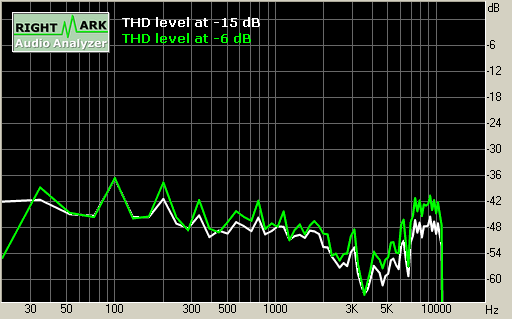 We can see on the graph that the frequency response of the nEar 05 monitor is ±5 dB at 70 Hz - 20 kHz. It's a relatively flat graph without surges and troughs. But you can hardly call this frequency response graph ultra-flat. 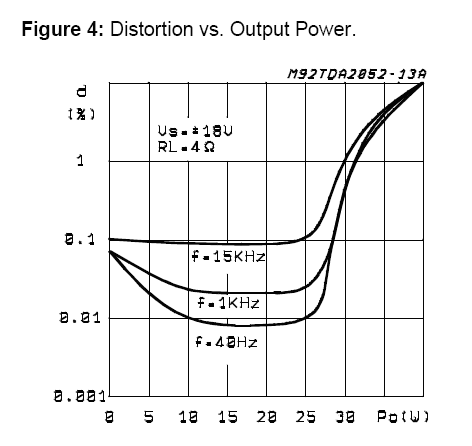 User's manual contains a frequency response, measured by the manufacturer in MLSSA. Our measurements slightly disagree with those made by the manufacturer. To be more exact, the graph has a different form. Nevertheless, MLSSA frequency response is ±4 dB at 80 Hz - 22 kHz. Let's proceed to measuring THD. We plot a logarithmic THD graph, as human perception is linear with logarithm. For your reference: -20 dB = 10%, -40 dB = 1%, -60 dB = 0.1%. The level of distortions on the THD spectrograms (2+3 harmonics) in the operating range does not exceed -36 dB. Let's have a look at the level of third harmonic, much more audible than the second according to psychoacoustics. As we can see, third harmonic has the most profound effect in MF range. These are quite good results. For subjective tests we connected the acoustic system to a professional sound card ESI Juli@. High-quality tracks in 24/96 format and a selection of the best CD-DA records were used as test compositions. Audition took enough time to get a complete idea of the audio quality. On the whole, nEar 05 eXperience monitors sound well enough, but there are no revelations. In our opinion, there are more pros than cons in the audio quality, but these monitors have some peculiarities that we should mention. Unfortunately, high-precision control over vocal recording is out of the question, as these monitors do not provide enough details at high frequencies and there is a small trough in upper-mid frequencies. These drawbacks hide various record defects and may distort timbres, when mixing records down. But as we know, not all users possess high-quality devices. If you have to solve the same tasks, but the required precision level is a tad lower, nEar 05 eXperience monitors will suit you. Comparing nEar 05 eXperience to its closest competitors Roland DS-5 and KRK Systems V4 Series2, it's hard to tell which monitors are better. But we can note the following. KRK takes up the lead in sound saturation with low frequencies, but its MF and HF quality is worse than in both competitors. Roland DS-5 monitors are the best at high and medium frequencies, being slightly inferior to nEar 05 eXperience in low frequencies. Thus, the choice of monitors should be governed by your own priorities or tasks. In our opinion, nEar 05 eXperience monitors rank between Roland DS-5 and KRK V4 Series2.